Ascend to the penthouse level and step inside a wonderland of coastal loft chic! With a finger on the pulse of bespoke style, the owners of Fistral Loft have thoughtfully renovated, created and presented to perfection. A central hallway welcomes you in and leads straight into the open plan kitchen, dining and living spaces with the far reaching sea views framing your coastal backdrop wonderfully. The stylish dining table is set at the gable end of the penthouse under the eaves and offers sea views as you dine is style, enjoy a morning's coffee and daily paper or slap up supper before heading out for a sunset sundowner. The living room is comfort personified with two indulgent sofas in which you can sink after a busy day of exploring. The budding chef in the party will adore the bespoke kitchen which evokes the cool kitsch nuances of a New York loft, from the illuminated vintage sign to the very best designer crockery, add a little 'kitchen cool' to your holiday self-catering. The boutique bedrooms are to the rear of the penthouse, each with a personalised style, relaxed amidst the soft grey and fresh white colour palette. The contemporary bathroom is no less considered with an exhilarating walk in rain shower, vintage inspired fittings and statement tiling. Swap your urban heels for sandals and your holiday has begun at Fistral Loft where considered holiday style comes as standard. The best view in town? 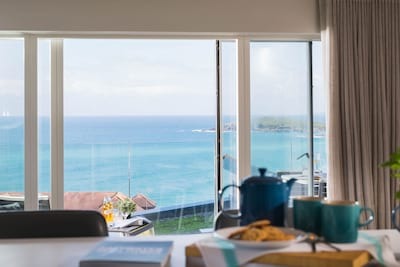 We're sure you will agree as you grab your camera and step from the kitchen out to the roof terrace to capture those oh so blue sea views, golden sands of Fistral Beach and away up the coast to the iconic headlands of the North Cornish coast. A built in wooden bench is perfect for a cosy couples cuddle up under a blanket or set up the dining table and chairs for an evening of al fresco dining. From sun up to sun set, watch the beach life go by below. If you are new to Pentire Headland and Newquay or its sights and sounds have become a family holiday favourite destination then Fistral Loft ensures the most perfect base. The world famous Fistral Beach is quite simply a skip from your penthouse door, follow the steps down past the cool surf cafe and sink your toes in the golden sands. A number of top surf schools are on hand to help you master the waves or admire the local's skills from the comfort of your beach towel. If eating out is on the agenda then you are in for a treat with a number of restaurants within easy walking distance including The Lewinnick Lodge, The Fish House, The Stable, Rick Stein's fish and chips, Gilmores and many many more. The more lively hubbub of Newquay can be dipped in and out of from your headland location. Day trips throughout Cornwall are easily achieved, head up towards Padstow or head South to the wild West including St Ives, Sennen and Land's End. Add a little beachside chic to your next holiday and book a stay at Fistral Loft whatever the season. There is level access from the parking space to the main apartment door, once inside there are 31 steps set over 4 shorter flights of stairs, with handrail. A very small step out onto the roof terrace from the kitchen. There is a sloping roof within the dining area of the apartment. No internal steps or stairs. We loved Fistral Loft!!! It's amazing. We were the first to book it and now we are the first returning customers. We will be back again in September! Excellent loft - a lot of time and effort had gone into making this a lovely home with no expense spared and such a lot of quirky bits and pieces! Beautiful property - faultless in fact. Beautiful apartment with stunning views and a balcony that makes is very special. In short the best rental I have ever arrived at in terms of cleanliness :) Lovely property, fantastic location and great customer service - a winning combination!